Hundreds of mostly Syrian asylum-seekers continued to arrive in Greece by sea Sunday despite the start of an international agreement to send migrants back to Turkey. ATHENS, Greece (AP) — Hundreds of mostly Syrian asylum-seekers continued to arrive in Greece by sea Sunday despite the start of an international agreement to send migrants back to Turkey. While the deal between the European Union and Turkey is officially in effect, the process for deporting migrants has yet to be worked out. Greek and Turkish officials are set to hold discussions on Monday. And Greece is still awaiting the arrival of 2,300 European experts, including translators, to help carry out the agreement. In the meantime, the EU said any new arrivals in Greece from now on will be subject to possible deportation. At least 875 new refugees — mostly Syrians, along with Iraqis and Afghans — landed on four of Greece's Aegean islands close to the Turkish coast between Saturday evening and daybreak Sunday. 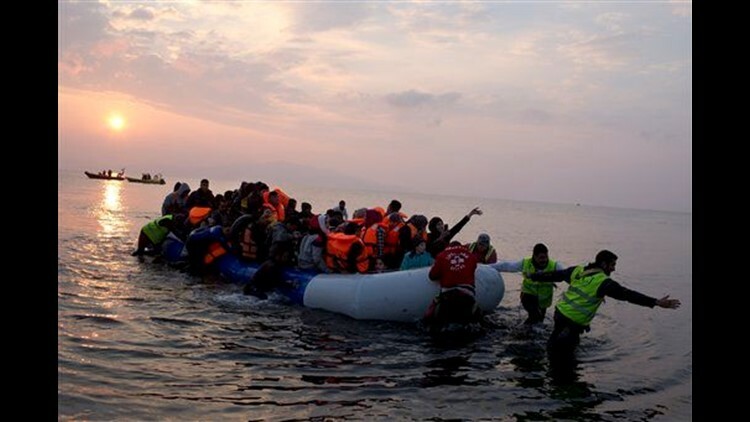 Two Syrian men were found dead of undetermined causes aboard a boat arriving on the island of Lesbos, and two girls were found drowned east of Rhodes, officials said. The EU-Turkey plan, agreed to on Friday, aims to halt smuggling by sending migrants who do not qualify for asylum back to Turkey. As part of the deal, European nations will then accept refugees directly from Turkey, starting April 4. The hope is to discourage asylum-seekers from trying to make the dangerous trip across the Aegean Sea on their own in flimsy boats. Turkey is also required to step up efforts to crack down on illegal migration. The deal puts Ankara on the fast track to get $6.6 billion in aid to deal with refugees on its territory. It could also lead to unprecedented visa concessions for Turks to visit Europe and a re-energizing of the country's EU membership bid. Turkey, which is already hosting 2.7 million refugees from war-torn Syria, has been a primary departure point for Europe, while Greece has borne the brunt of arrivals. More than 1 million migrants have arrived in Europe over the past year. Giorgos Kyritsis, a spokesman for the Greek government's Refugee Crisis Coordination Center, said none of the 2,300 experts promised by the EU has arrived yet. The EU-Turkey deal "is in force. Its practical implementation remains to be seen," Kyritsis said, adding that Greece had done its part to prepare the temporary camps where the migrants will be processed. Those who arrived in Greece up until Sunday morning will be subject to the old rules, which say that for every Syrian returned to Turkey, another Syrian will be resettled in an EU country, Kyritsis said. A Turkish news agency reported Sunday that 320 would-be migrants to Greece had been intercepted in a coastal Turkish town. The private Dogan agency said the migrants were caught in the town of Dikili, a main crossing point to Lesbos. Amid all this, Greece is still relocating migrants from its islands to temporary refugee camps on the mainland. A ferry carrying 1,169 migrants arrived Sunday at the port of Elefsina, west of Athens. Another ferry carrying some 1,300 migrants was on its way to Elefsina from Lesbos. The arriving refugees were put on buses headed for a camp near the northwestern city of Ioannina. The camp will contain 420 tents that can house eight to 10 people each. "I don't want (to) go back to Turkey, because I would be back to the work and the hard life. Difficult life. I wish (to) continue my race to Europe to see my family and continue my studies," Syrian refugee Amdelsher Abdel Hannan said as he was getting on a ferry to take him from Lesbos to the Greek mainland. On the Greek border town of Idomeni, where about 10,000 migrants who were refused entry into Macedonia are stranded, the mayor criticized what he said are plans to make the sprawling, muddy, makeshift encampment permanent. The government "asked us to bring sleeping cars through Hellenic Railways, approximately seven or eight cars to accommodate refugees. That's not the solution. I think the (camp) should be evacuated," said Christos Goudenoudis, mayor of Peonia. "The locals are starting to fear what the migrants will do when they run out of money," Goudenoudis said. Kyritsis told The Associated Press the government plans to evacuate the Idomeni encampment, not make it permanent. Refugees started piling up in Greece after Austria and countries farther north started closing their borders to them.